2 BR, 2 BA CONDO – PRIME DOWNTOWN LOCATION – SLEEPS 6 Located at the corner of Park Avenue and Four O’Clock Road in downtown Breckenridge, our Park Place condos are close to the lifts and a short stroll to Main Street. Guests can ski down Four O’ Clock Run and walk to their condo. The complex also features two on-site outdoor hot tubs, a gas fire pit and free covered parking, as well as access to the Upper Village swimming pool and hot tub. This 2-bedroom, 2-bathroom moderate condo is the perfect getaway for families or groups of up to six. Comfortable furniture, great amenities and an awesome location make this condo perfect as a mountain getaway anytime of year. Walking into the living area, you’ll be impressed by the comfortable furniture and beautiful river rock gas fireplace. The fully equipped kitchen has everything you need to whip up a home cooked meal and there is plenty of room for everyone with six places at the dining room table and three more at the kitchen counter. The private balcony has comfortable furniture and a barbecue grill. You’ll love being just across the street from downtown and the free shuttle to take you around town in both the summer and winter! Other amenities include complimentary Wi-Fi, in-unit washer/dryer, and parking for two vehicles. 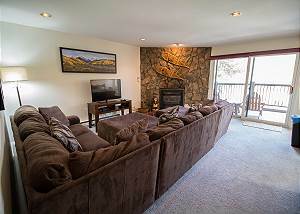 This is the best unit available in one of the best locations in Breckenridge! Call us or book Park Place 202B online today! SLEEPS 6: MAIN LEVEL - King suite: king bed with private bathroom and LCD TV. - Queen suite: queen bed, bunk bed, private bathroom and LCD TV. SPECIAL UNIT NOTES – PLEASE READ: - No Pets / No Smoking. - A $350 refundable damage deposit will be charged to credit card at check in. - Renters must be a minimum of 25 years old. - Pool Access Dec-April, July-Sept. - Parking: 2 outdoor spaces total. - No air conditioning. All units include at least one fan. - Business and Occupational License #331690001.